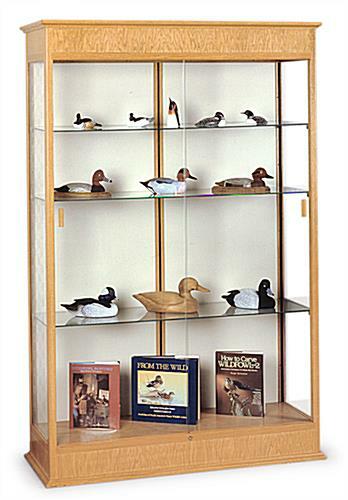 These Display Cabinets Welcome Visitors Warmly! 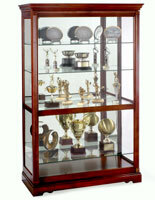 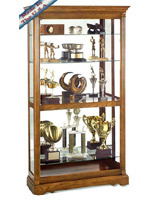 This upscale wood display cabinet with lighting is perfect for presentation of awards, trophies, or known as a welcoming lobby unit. 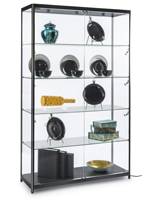 Cove molding beautifully accents the exterior of the display cabinet. 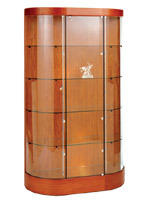 This glass showdisplay cabinet incorporates a light autumn oak base with awareness-grabbing mirror back, sliding door with tempered glass and engineered-in lock for extra security, three 14" deep full-length adjustable shelves with brackets and engineered-in lighted cornice which highlights your collection. 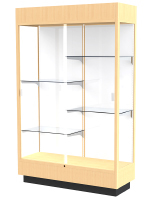 Lighting is at top of display cabinet and requires two basic tube-strip fluorescent bulbs (not included). 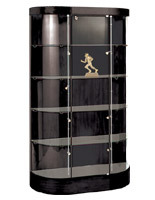 Plugs into a standard 110 electrical wall outlet. 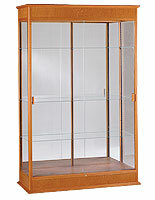 Wire runs out of top-backside of display cabinet and can drop in the back of solid backing so unseen. 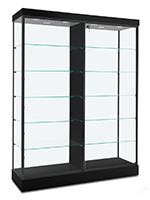 Special glass is engineered in directly beneath light bulbs to diffuse brightness and shelter the visual elegance of the display cabinet.